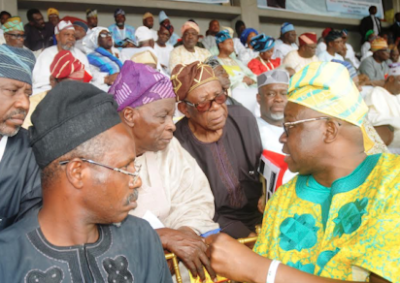 The Yoruba nation, yesterday, insisted on a return to the federal system established by the founding fathers of Nigeria in the 1950s, where each section of the country was able to develop at its own pace. Those in attendance included the governor of Ekiti State, Mr Ayodele Fayose; Ooni of Ife, Oba Enitan Ogunwusi II; former governor of Ondo State, Dr Olusegun Mimiko; former governor of Ogun State, Otunba Gbenga Daniel; former Secretary to the Government of the Federation, Chief Olu Falae; Afenifere leader, Chief Reuben Fasoranti; Chief Ayo Adebanjo, President of Ohanaeze Ndigbo, Chief John Nwodo; former Director General of the Department of State Services, Chief Albert Horsfall; Special Adviser to the President on Political Matters, Sen Babafemi Ojudu; former Minister of Aviation, Chief Femi Fani-Kayode; former deputy governor of Lagos State, Sen. Kofoworola Bucknor-Akerele and former deputy governor of Ogun State, Senator Gbenga Kaka. Others were the founder of the Oodua Peoples Congress, OPC, Dr Frederick Fasehun; National Coordinator of OPC, Otunba Gani Adams; chairman of Yoruba Council of Elders, Chief Idowu Sofola; Sen Iyiola Omisore; Sen Mojisola Akinfenwa; Dr Doyin Okupe, Senior Special Assistant to former President Goodluck Jonathan; Col Tony Nyiam (retd); Chief Supo Shonibare; Mr Wale Oshun; Senator Ike Nwachukwu; Professor Tunde Adeniran; Orangun of Ila, Oba Wahab Oyedokun; Oba Lekan Balogun, Otun Olubadan of Ibadanland; Oba Latifu Adebimpe, Ashipa Balogun of Ibadanland; Archbishop Ayo Ladigbolu, retired archbishop of Methodist Church Nigeria; Alaafin of Oyo, Oba Lamidi Adeyemi who was represented by Bashorun of Oyo, high Chief Yusuf Ayoola; Mr Babatunde Oduyoye, AD chieftain and Dr Yemi Farunmbi. Former governor of Lagos State, Asiwaju Bola Tinubu and five of the six governors from the region were, however, absent. Chief Niyi Akintola, SAN, moved the motion for the adoption of the communique, which was unanimously adopted by the gathering. In the communique, the Yoruba Summit noted that Nigeria was dangerously edging towards the precipice but must take urgent steps to restructure the nation from a unitary constitution to a federal constitution as negotiated by the nation’s founding fathers in 1960.